Do you love History and sometimes fantasize about living in a different era? Do you fancy hanging out with Clark Gable or Walter Cronkite and sipping cocktails? Do you enjoy dying over and over again in awful ways only to see yourself yanked into a different time period? If so, then Old Twentieth may be for you. The novel takes place hundreds of years in the future and due to nanotechnology and medicine, Humanity has made itself nearly immortal. The book follows a Virtual Reality Engineer, named Jacob Brewer, on a thousand year, five ship journey to an Earth like planet called Beta Hydrii. Jacob’s main purpose is to do maintenance on the ship’s Virtual Reality computer called the “Time Machine” which simulates different eras of human history. Of all the time periods, the 800 person crew favours “Old Twentieth” the best. This era represents a time when struggle was real and the future was uncertain. As Jacob enters different times in search of glitches we find more and more bizarre occurrences within the VR. Despite these abnormalities, everything seems fine until someone dies inside the simulation. Old Twentieth calls into question what it means to be alive, what it means to die and what it means to imagine. The more we read the more we begin to learn that maybe this reality is stranger than we think. Joe Haldeman is an award winning author known for cranking out short Sci-Fi novels based on war history. He is a well rounded professor of writing at MIT who has degrees in physics, astronomy as well as being a Vietnam veteran with a Purple Heart. So yeah, he’s kind of a badass. The strength of this book is in experiencing the Time Machine first hand. While reading, we’re transported to different times in the 20th century and experience what it would be like to have the Spanish Flu, storm across no man’s land in World War I or transport to 1957 and eat a bowl of Skyline Chilli. The novel starts fast and pulls the reader in. Each time a person is about to die they are transported to a different era until their twenty hours of VR time are up for the week. Oh yeah, I forgot to tell you. They all have to share the Time Machine one at a time so there’s a waiting list that stretches for weeks. The rest of the time people just kinda hang out and waste time doing...immortal person things. While inside the VR, people report that these twenty hours feel more like a week and they often forget they’re in a simulation. Though the premise is interesting, around chapter 10 I found myself skimming. This is a plot based novel and I was not impressed by the character development. In addition, the themes of the book seem to be all over the place and do not offer any defined argument for any one specific subject. There’s very little emotional build up to any of the major plot points and the main character, Jacob, is McDonald’s 99 cent vanilla at best. The central romance is one step above vanilla and the novel is really about wasting time on a spaceship. For a long time, there is no real mystery or conflict. There’s no heroic journey or dazzling thrills. It’s mainly just Jacob going to different time periods and then wasting time when he’s not. The author keeps coming back to the motif that Jacob loves ducks and maybe that’s what he’s trying to say. On the basis of this work of being philosophical or literary art, Old Twentieth is a lame duck. Though this might sound harsh, Old Twentieth is still worth reading for its unique descriptions of historical times. Just don’t expect to be dazzled by immersive concepts or enticed by unique characters. Yes, there is a twist at the end and some people may say this makes the book worth reading, but I disagree. I think the book is worth reading for the ability to go from one chapter to the next and be transported to many different time periods. Later in the novel, greater conflicts develop and mysteries open but I often felt they were somewhat forced. If the book had been one-hundred to two-hundred pages longer I feel that Haldeman could have done a better job exploring character development and given us a true gem. However, that is not what Haldeman is known for. He writes short, impactful war stories and that’s what this is. 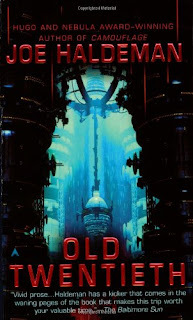 Haldeman may have brushed the surface of many ideas without committing to one but regardless, Old Twentieth is a good read for anyone who is interested in the practical consequences of simulating time travel or who simply wants to indulge in the nostalgia of forgotten eras. Though I’m hard on it, Old Twentieth was a good read and is essential if you wish to expand your mind to the potential of VR and AI. So buy it, rent it, borrow it whatever. But this is not the Forever War series. It’s not The Martian, Ready Player One or Cloud Atlas. This is something to read while you chow down on some delicious Skyline Chilli. Which I highly recommend you do. Right now...go.